Squam Lakes is composed of Little Squam (408 acres) and Big Squam (6383 acres) Big Squam is the second largest lake in New Hampshire. In the Squam lake area you will not find any box stores or chain restaurants. The area is as you would expect a quaint New England Town to look like. Squam Lake is where On Golden Pond was filmed and you will find many references to Golden Pond around the lake. The Squam shoreline has open space and is dotted with luxury homes to seasonal cottages. Squam is the jewel of the New Hampshire lakes. Locals attend Sunday services on Church Island and many marriages are performed there. There is also a nesting Eagle sanctuary and many man made Loon nesting areas. is located at the southern end of Little Squam with a population of just over 2000. Many refer to Ashland as taint; you taint north and you taint south. Ashland lies just about in the center of NH. The town has a small downtown where you can find restaurants and groceries. Major shopping can be found just a few miles north in Plymouth where the hospital is located. In addition to boating, hiking, biking, snowmobiling and skating in the winter, you will find an air strip on the lake where you can land your plane during the winter months. For more town information visit the Ashland NH website. is dotted with bed and breakfasts and is located on Little and Big Squam Lake. You can boat from one lake to the next through the Squam Lake Channel which is located in the middle of town. The population is just over 2000 residents. 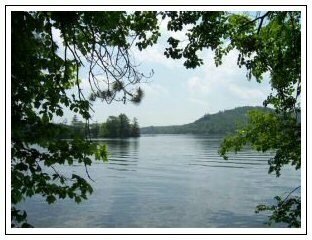 The public boat launch is located between Big and Little Squam lake and has plenty of parking. Don’t bring your jet skis along as they are not welcome on this scenic and quiet lake. Across the street, an attraction not to be missed is the Squam Lakes Science Center. During a short hike around the grounds you will find some of New Hampshire’s local animals in their natural settings. There are bear, eagles and deer. Hiking, biking, snowmobiling and cross country skiing are all within minutes. Loon, Cannon and Waterville Valley Ski areas are less than 30 minutes away. There is plenty of shopping and a hospital is located in Plymouth, your neighboring town. For more town information visit the Holderness NH website. is geographically one of the larger towns in NH with 93 square miles, surprisingly it has a population density of less than 15 residents per square mile. Sandwich is designated as an historic town and is the cultural hub of the NH lakes region. In October you can visit the Sandwich Fair, a cultural event not to be missed. The town was recently ranked by Yankee Magazine # 8 in the top foliage towns to visit. There are summer boating and beach activities, golf, and Old Home Week in August. Don’t miss the Art Show on the Green. In the winter, skiing is close by along with some exciting sled dog racing events. For more town information visit the Sandwich NH website. has miles of shoreline on Squam Lake yet when driving through town you will never see the lake. There is a small town center with a general store you must visit along with shops spread out along route 25. Do visit Castle in the Clouds while you’re here, a great location for hiking, history and lunch. There is a newly renovated hospital in Wolfeboro. Grocery stores are located in Wolfeboro and Center Harbor. Boating, hiking and snowmobiling are popular in this resort town. For more town information visit the Moultonborough NH website. has shorefront on Squam and Winnipesaukee. The town has a population of just over 1000 residents and is located on the shoreline of Lake Winnipesaukee. In town you have a fine grocery store along with some distinctive shops and a hardware store. There are some very nice restaurants in town. Center Harbor is also the winter berth for the Mount Washington. This summer cruise line tours the lake all summer long stopping at major towns along the way. There is plenty of boating activity to be had on Big Squam Lake. Golfing, hiking and biking are all close by. In the winter you can snowmobile, ice fish, ice skate and the ski slopes are just over an hour’s drive. For more town information visit the Center Harbor NH website.